The products of Garnier Ultra Doux Heritage de Provence base on natural extracts and subtly scented essential oils obtained from the French region of Provence. This is how a shampoo of captivating scent and containing precious oils with strong moisturising and nourishing properties (apricot kernel oil and sweet almond oil) has been created. What are the properties of Garnier Ultra Doux Heritage de Provence Apricot from Roussillon and Oily Almond extract? How does it work on hair? Is it efficient? Read the review below. 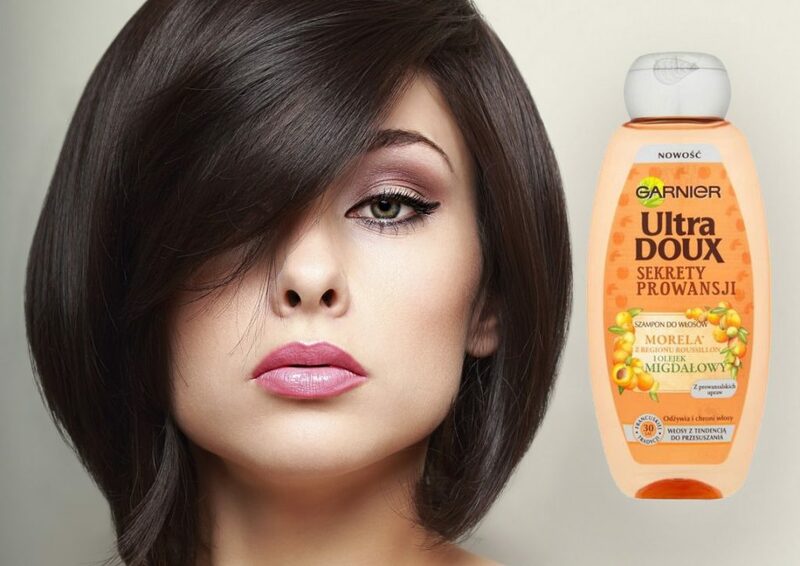 Garnier Ultra Doux apricot and almond oil comes in an elegant bottle of apricot colour. It has the capacity of 250 ml and the product has a thick consistency. It is an efficient cosmetic that lathers very well and delights with fresh scent which stays on hair for a long time. The main task of this product is to moisturise and nourish weak hair that lack shine and softness. It is a perfect cosmetic for summer, when the strong sun can dry your wisps and for winter, when hair is dry because of the radiator air. The shampoo lathers very well, therefore, the use of the product is very pleasant. The delicate foam has a mild, fresh scent which stimulates all your senses. After shampooing, your hair is resilient, soft, shiny, easier to comb and style. it gains moisture, gloss and is pleasant to the touch. It is all thanks to the content of natural oils. Almond oil is famous for its nourishing and moisturising properties. Additionally, it is delicate and gently nurtures scalp. Apricot kernel oil provides moisturising, nourishing and softening effects. However, not only women with dry or damaged hair can use oils of almond and apricot. The product will be suitable for normal or greasy hair, which ends have the tendency to dry, lose lustre and resilience. Garnier Ultra Doux Heritage de Provence Apricot from Roussillon and Oily Almond Extract shampoo has a gentle formula, however, it is not free of SLS – comedogenic substances of artificial origin. Unfortunately, those components can interfere with the work of sebaceous glands on the on the surface of the scalp.